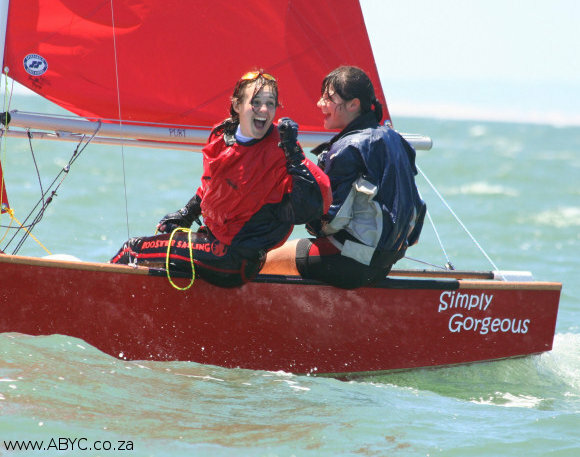 I was trolling through YouTube looking for Port Elizabeth related sailing videos and came across an ‘old friend’ which immediately sparked some really good warm and fuzzy memories of the Mirror Worlds 2007 Championships sailed during January 2007. This event took place after the devastating fire and must go down in history as one of the most fantastic all round and fair international events ever held as it dished up incredible sailing conditions from all points of the compass with varying sea state and wind to produce true all round champions who won the event on the second last day – see report below the video. Well, it looks like the 2007 Mirror World Championships host club, the Algoa Bay Yacht Club have a hot line direct to the weather gods as today dished up another incredible days racing with a wind speed that never rose above 18 knots, despite the long term predictions of 20 and 22 knots of hard easterlies. Two races were sailed today to bring the regatta series total to 11 races sailed and one more to be sailed tomorrow, the 18th January 2007. The first race was started at 10:15 a.m. in a light chop and the wind from east south east at 13 knots. The course chosen was number two, triangle, sausage, and the fleet started under threat of an I Flag and only one boat failed to round the ends and be scored On Course Side (OCS). The first finisher completed the course in 72 minutes and the last boat finished 13 minutes later. Anna Mackenzie and Holly Scott (GBR) finished in first place, Doire Shiels and Graham Daly (Ireland) were second and Nick Davis and John Collova (Australia) third. Race number two again over the triangle, sausage course was also started under an I Flag and the wind shifted 15 degrees to the south east. This, the 11th race of the series was much faster with the first boat finishing in 53 minutes.First over the line was Nick Davis and John Collova (Australia) with their fourth first place of the series, second Juliet and Richard Long (GBR) and third were Anna Mackenzie and Holly Scott (GBR) to seal their place in history as the first female Mirror World Champions. All competitors agreed that today was fast and exciting with the swell that had been pushed into the bay by the east that had been blowing. Some exciting surfing took place en route back to the Algoa Bay Yacht Club, hot soup and a jam of sailors waiting for the results. The FIRST time that the same team – Anna Mackenzie and Holly Scott (GBR) – have won BOTH the Mirror Pre Worlds and the Mirror World Championships. The FIRST GBR team to win since 1997. The FIRST time that current or former members of the RYA Junior Development program have won a Mirror World Championships. Anna Mackenzie and Holly Scott finished today on a nett total of 28 points. The next closest boat, Nick Davis and John Collova (Australia) are on a nett of 46 points. If Anna and Holly do not sail to-morrow they will discard the maximum and get 16 points added to their total for a nett total of 44 points which is still 2 points ahead of Nick and John. Extremely consistent sailing from a likeable team of girls who also get the prize for being the prettiest sailors to ever win the Mirror World Championships. Tomorrow is the last day for sailing and we only have to get one more race in to make the series. The weather again looks to be very different with a south south west in the morning swinging to the south and blowing from 7 to 11 knots. A nice sunny day of 25 degrees celsius and swell below 1.3 metres. ABYC have put in a bid to host the 2015 Mirror Worlds and are looking forward to treating the Mirror fleet to yet another awesome sailing championships. Click here to see the Sailing Videos shared by members AND/OR Click here to submit and share your own.